Fed up with tantrums? Actress, mother, and neuroscientist Mayim Bialik shares the “parent time-out” exercise she uses when the demands of her sons Fred and Miles push her to the brink. 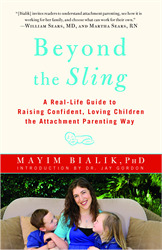 From her book, Beyond the Sling: A Real-Life Guide to Raising Confident, Loving Children the Attachment Parenting Way. I learned a relaxation exercise in Dr. Ilene Val-Essen’s Quality Parenting class that has significantly helped me lower my general state of aggravation and tension. The best thing about it is that it takes about ninety seconds to do, it can be done standing up, sitting down, in the shower, while brushing your teeth, or in between the front door of your house and the car. Incredibly, any time I do it, it helps, and the feelings this exercise brings me can be summoned throughout the day, whenever I feel my tension rising and my frustration building. It’s sort of been the magic wand in my parenting, and I try to do it in the morning in between waking up and getting out of bed, typically while nursing Fred and being jumped on by Miles, but it works just the same. 1. Inhale, imagining negative energy leaving your belly and moving up through your heart, through your throat, and into your head. 2. Hold the breath for five seconds, imagining the negative energy being transformed into positive energy. 3. Exhale and picture the energy leaving through the space between your eyes, releasing any tension there and filling the room with the positive energy you just made. 4. Take a deep breath, acknowledging that you just turned negative energy into positive energy. 5. Repeat two more times. A parent time-out is not a punishment, nor is it intended to communicate to a child that her behavior is pushing you away. It is important to make your intentions clear to your child: that you are unable to talk more or discuss anything further without cooling down. With candor and warmth, Bialik describes the beauty, simplicity, and purposefulness of attachment parenting and shows us that its core principles are universal and can be appreciated no matter how you decide to raise your child.